Source is Windows 7 x86 or x64 fresh installed in 10-15 GB VHD Or Install on primary active partition of internal harddisk. 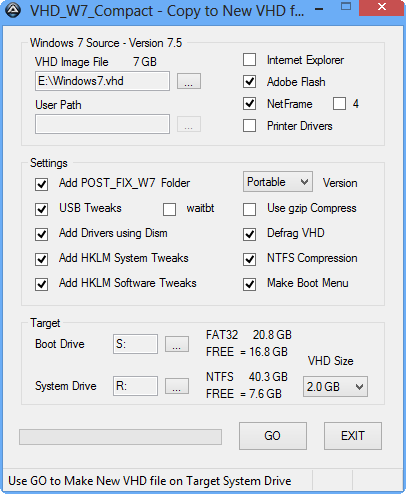 Target Boot Drive can be FAT32 or NTFS USB-drive used only for Boot files so that there are no changes for booting of internal harrddisk . Target System Drive must be NTFS and is the drive where the Win7 VHD file is created and this can be your internal harddisk drive. Ultimate Windows 7 VHD files make use of Microsoft VHD HBA driver which allows in Boot Manager Menu to boot VHD as FILEDISK. Run first VHD_W7C_drivers.exe plugin to add useful extra drivers to makebt\drivers folder. Let Portable version boot on different hardware to make it Universal by Install of Drivers. Use Universal Portable W7 VHD as Source to make Mini 7 VHD that can boot in any case on all experienced hardware. Mini 7 has smallest Size of about 600 MB by removing Windows Media Player and by further reduction of system32 and DriverStore. Mini 7 is very useful to Boot from RAMDISK on known hardware, since servicing for Adding Driver Packages has also been removed. Build-in Defraggler is useful (really needed) to Defrag files within the W7 VHD, but post processing is also possible after mounting the W7 VHD. 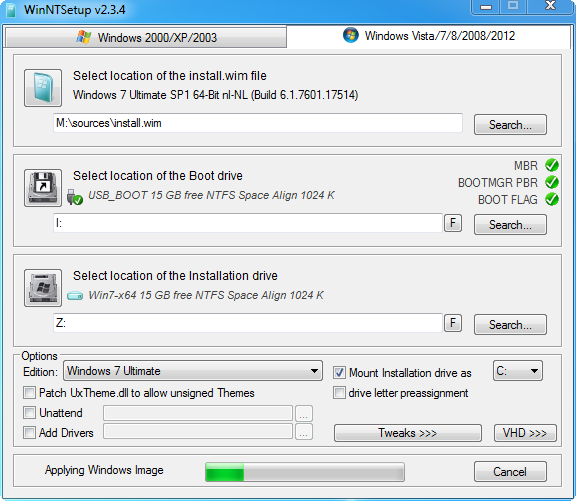 VHD_W7_Compact.exe can create Boot Menu entry on HDD or USB Boot Drive for the Win7 VHD on NTFS Target System Drive. VHD entry is added to Boot Manager Menu and Grub4dos Menu is made when FiraDisk or WinVBlock driver is found. Program UEFI_MULTI can be used in Win 7/8/7PE OS to make other HDD or USB drives bootable with the created Win 7 VHD. In this way you boot from USB and Install in VHD located on primary NTFS partition of internal harddisk. USB-Stick can be FAT32 or NTFS and has only Boot files so that normal booting of internal harddisk does NOT change. and also for loading Mini 7 VHD in RAMDISK by using FiraDisk driver and Grub4dos boot menu. Following on from my post in the other thread, I created a new Full with v75 from here and then a new Portable (from the original source, not from the Full copy). Strangely, the Full doesn't boot properly. It gets past the boot animation fairly quickly but then I'm left with a blank screen and a movable cursor. I left it for about 10mins and no change and it was the same on the next boot attempt as well. I did attempt to use the in-built defragger (I used NTFS compression for both builds) but unfortunately it doesn't seem to register as activity to Windows and it went to sleep at around 33%, so I had to scrap that build and make a new one in case it was corrupted. I defragged manually with defraggler by mounting the VHD afterwards from then on. I left waitbt unticked and I think also USB Tweaks (as I don't intend to use this build from USB) on all builds. Having compared booting the (Portable) VHD from HDD and CF now, they both boot pretty much just as quickly. Where the slowdown comes in is once it's booted and starts installing drivers, due to the much slower write speeds of the CF, such that it becomes quite unresponsive and the Device Manager redraws quite slowly. This also accounts for the slow shutdown of about 10s with the HDD and 130s with the CF! Once the drivers are installed though, it should be quite usable as a RDP station, particularly if I install the EWF filter but I wonder if there's any way to eliminate a lot of the writing at shutdown in order to make it a lot quicker when using the CF? I can't really imagine what it tends to write at shutdown but no doubt someone will know. I bought a s/h Nvidia FX5200 for £8 as her onboard graphics (i815 I think) didn't appear to have a WIn7 driver available. I also put a spare NIC card I had lying around in as the onboard didn't have a driver either. I managed to find a driver for the onboard sound. So it's all working well enough, except the odd pause when doing certain things, like opening Control Panel and the long shutdown delay, which I might be able to eliminate by installing the EWF filter and there's between 100-200MB free RAM at most times (I'm booting from CF Card so enabled the swapfile on the HDD to avoid running out of RAM and crashing) but when I RDP to the Win7 machine in the next room, it's unusably laggy and unresponsive half the time. Using my Portable XP (updated with drivers for the new hardware) and the RDP works fine there. I expected RDP to work better if anything using Win7, considering all the improvements and patches that have been added. Even more sad, the FX5200 has not improved the ability of the machine to play online video one bit, with even 360p clips in a small window dropping half the frames and running at something like 11fps. It seems it's unable to use the card to hardware accelerate the decoding, as with that enabled it still shows software decoding in the info box, so I guess it's having to still use the CPU (P3 833Mhz I think) to play the video and obviously that's not up to the job. It actually worked better over RDP, as I guess then the server is doing a lot of the work and it starts off at 25fps but after about 10-15s this drops down to about 16fps and it gets stuttery (both audio and video), so either the server can serve the data quick enough or the client can't cope with the incoming data (it's nowhere near saturating the 100Mbps link though, under 25% I think). /> />/>/>/>can I make w7 pro VLK booting from VHD or must it be ultimate or enterprise editions? also what virtual machine software can boot .VHD? I am only familiar with VMware which uses .vdmk and Qemu which uses .raw and I want to boot the .vhd created with your tool in a VM also. Win7 Professional can be used as Source, but you have to Install to NTFS primary partition instead of using VHD. Only Ultimate and Enterprise Edition can be Installed direct to VHD by using WinNTSetup2. After Install of Win7 then this Source can be used by VHD_W7_Compact to make New VHD of reduced size. I have no experience with Virtual Machines. - Target Boot Drive can be FAT32 or NTFS USB-drive used only for Boot files so that there are no changes for booting of internal harrddisk . - Target System Drive must be NTFS and is the drive where the Win7 VHD file is created and this can be your internal harddisk drive. Microsoft VirtualPC uses *.vhd files. hi Wimb, 1st boot after compact in new 2gb vhd I get error "RunDLL There was a problem starting C:\Windows\ehome\ehssetup.dll The specified module could not be found." OS is x86 Enterprise edition. how can I correct this error? also, activation status now says "Not Available"? links to here but I dont see more info here? edit: RunDLL error does not reoccur after reboot. hi Wimb, now I use 7 Ultimate as source with WinNTSetup_x86. after I run VHD_W7_Compact Event Viewer no longer works, gives error "MMC could not create the snap-in"
is this expected or is something wrong? If it is expected then how can I make event viewer working again? the other snap-ins device manager and services are working and the eventviewer .exe, .mmc, & .dll are present. and I still dont understand how VHD_W7C_drivers.exe works. Did you Uncheck the NetFrame Checkbox ? Some MMC snap-ins require NetFrame, so you should keep it checked. 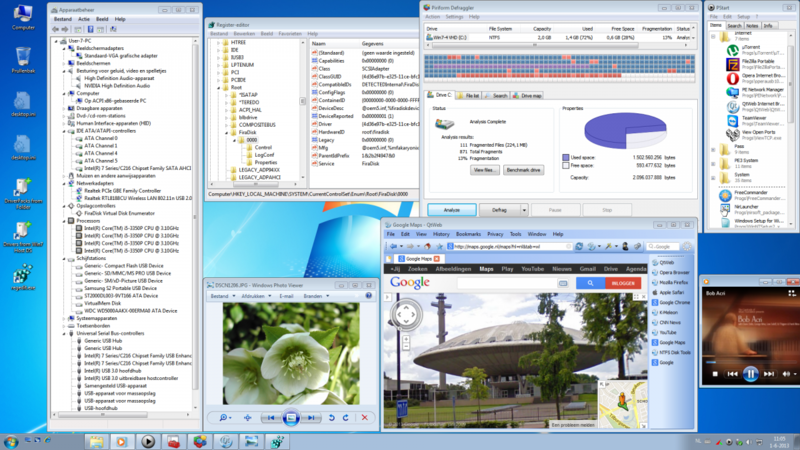 Windows 7 has a lot of drivers build-in, but more recent hardware like Intel i5 Ivy bridge processor and Intel USB 3.0 require extra drivers. Dism can add such extra drivers when they are supplied in makebt\drivers\WIN7_x86 folder. I did not check .net4 so I retry and check it. now with it checked I get errors: "FileCopy Error - Overflow" and then "OVERFLOW - Not enough Space in VHD Drive"
so I try larger size setting 3.5gb and same errors, the next size offered in your program to try is larger than my source VHD. also, when defrag is checked it stops with pop-up "Defrag Ready - Inspect VHD Drive" says to inspect and modify as needed including "Wipe Free Space using CCLeaner Tools"
how important is this "CCleaner Tools", I dont have it so I skipped that and clicked OK and it consinues progress untill I get the not enough space error. The FileCopy Error occurs when both NetFrame and 4 are checked, but that is not due to OVERFLOW so larger VHD size will not help. Thanks for reporting this error for FileCopy of assembly\pubpol4.dat . I will try to find solution. I meant to have NetFrame checked and 4 Unchecked which is the default case. The NetFrame will be needed for some MMC snap-ins. The Defrag Ready pop-up is normal and serves to offer the user Manual inspection / modifycation of the created VHD. 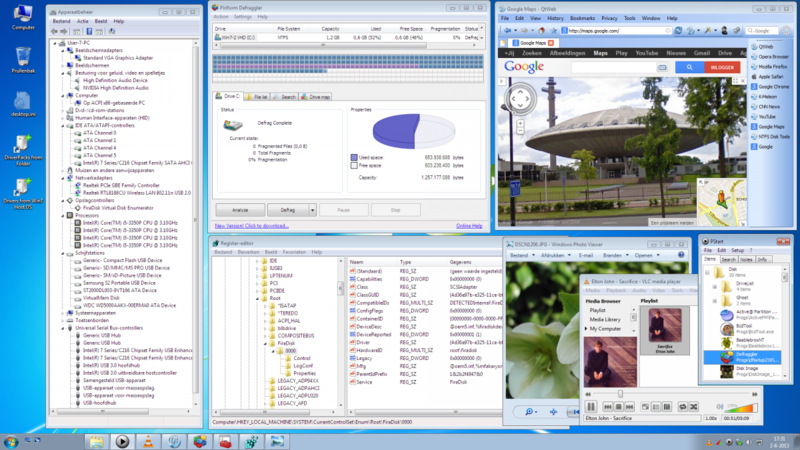 CCleaner is useful to wipe FreeSpace. In that case gzip file will load faster into RAMDISK. In general you don't need to do anything at the Defrag Ready pop-up and can simply press OK.
read only flag as i had reported earlier. Indeed I must try to remove read only flag in case of FileCopy error. That will solve such problems. Ive been searching for solutions to slim down W7 and only find this program for post installs. just need event viewer and easyBCD working and .net4 is required for easyBCD. how can I transfer w7 installed in original .vhd by winntsetup to direct booting from USB HDD? one of your tools? also I think you should put readme txt with function and instruction in root of extracted directory in your tools. 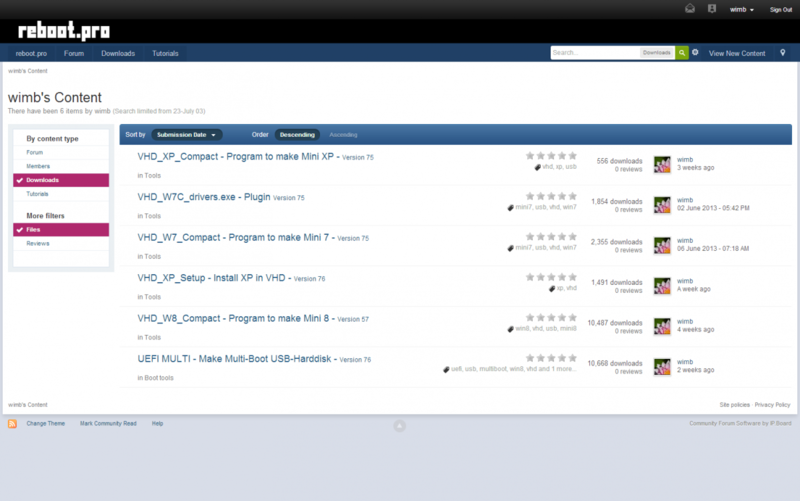 also I extract some tools you have only to find it was already included in another tool. I think you really should combine all tools in one. this will lessen confusions some. Using Default Settings in VHD_W7_Compact.exe is working OK. I dont need .vhd booting right now, only compact w7 but if I can reconvert the vhd to RHD (Real Hard Disk) I can still use your tools for that (no other options for post sliming w7 otherwise at this point) probably could use your tools for alot more but figuring them out (how to use, what they do, etc.) is very very difficult. Each Checkbox has Tool Tip (move your mouse) e.g.
" and only make changes when you know what you are doing ...."
thats what I am trying to learn "what you are doing" so I can know what "I" am doing. I have noticed the mouse over pops (could stay up a little longer on some of them) but "Dism will Add Drivers to DriverStore\FileRepository" is not enough info. what drivers does it add? I look in each folder and read each registry bat and try each .exe separately so I can get an idea what is going on but I would rather read documentation about it. anyway, your tools are as impressive as they are confusing LOL, keep up the good work! In that case it is just readable text and some explanations are given there as well as in the IMG_XP Tutorial. 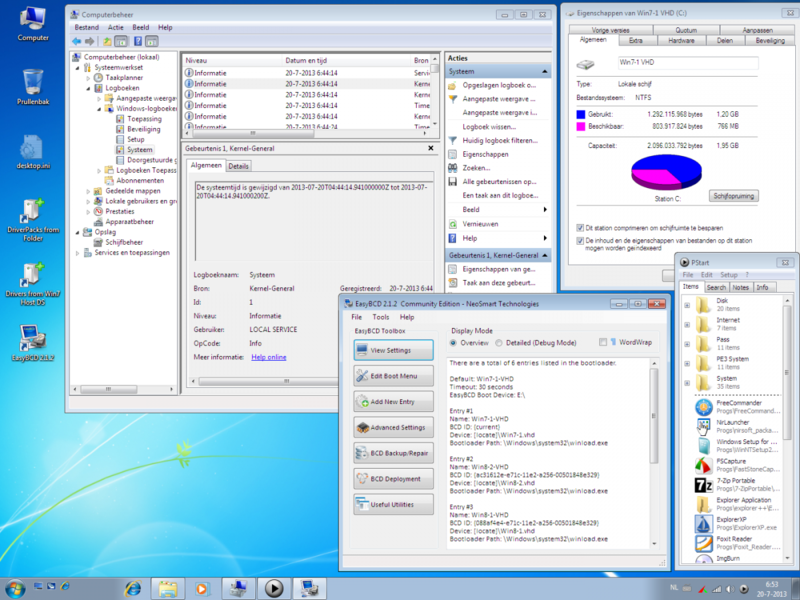 I created a VHD with VHD_W7_Compact.exe and just copied the files from vhd to a hdd partition. You may need to add bootmgr & boot folder. It works. Very well in fact. I use it on a old P4 DDR1 PC. If booting from HDD, I would advise you to use portable instead of compact. If you are booting from HDD on one system only, afaik you need not use any of the tweaks - that's what I do. I also re-copy the entire .NET folders (from the full W7 install), they seem to exist in 3 places. On a HDD space is not much of a problem. EDIT : I use a SATA HDD not a USB HD. Hi I am a new member and first of all I have to say thanks for these wonderful and very handy programs and methods/tutorials that you have shared with the world endless Thanks. I have found these most useful since I can create, customize and store VHD's for varying tasks and never have to go through installing and customizing each time I want to do a fresh install. I have a VHD portable to be exact which I recently made I have been reading about the different programs to integrate drivers and such but I don't really quite understand that much. I have been googling searching for methods to troubleshoot this error but when I install "Microsoft Visual C++ 2005 Redistributable 5.8.0.59183" (vcredist_x64/x86) they don't seem to install or work and doesn't show up in programs installed as it does in the Full Copy VHD. I mentioned this specific version (I also tried the newer ones) because when I look in my Full Copy VHD I see it is the only MVC++ installed and the program works flawlessly. My question is if there is a proven fix or what can I do before making the Portable VHD so that I wouldn't get this error or if you or anyone here knows how to extract and transfer the said program from either the Full Copy VHD or the Windows 7 Ultimate x86x64 iso to the Portable VHD if it is possible? Then use VHD_W7_Compact.exe and see if that is sufficient for you. That fix is certainly needed and will appear in next version.